The GSAS LPC 1768 is a development and evaluation board that is built on the NXP LPC1768 platform, an ARM Cortex-M3 based microcontroller for embedded applications featuring system enhancements such as enhanced debug features and a higher level of support block integration. With its extensive features and capabilities, it is a board that can accelerate your development with ARM-based products. This board also serves as an excellent educational tool for training of next-generation embedded engineers at educational establishments. Powered by PC’s USB port. 300MB of Hard disk space. 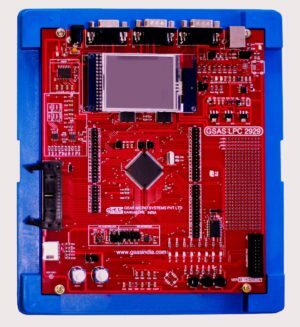 The GSAS LPC 2929 board is built around the NXP LPC 2929, an ARM9 processor-based device, allowing you to create and test working programs for this advanced architecture. This board has a wide range of interfaces making it a great starting point for your next ARM project. This board hosts the LPC2929 microcontroller from NXP with an embedded ARM968E-S processor core and JTAG interface. In addition, the driver chips for the external communication interfaces are included. All microcontroller IO port pins are accessible via connectors. The device drivers can be disabled via jumpers to have control of the microcontroller I/O pins. The board is powered by a USB port. A serial connection is provided for In-System-Programming (RS-232). There is a provision for CAN and USB interfaces enabling industrial automation as well as automotive applications. The board has 8 LEDs, analog input (via potentiometer) and three switches as GPIO. This board, with a power supply connector and 26 pin FRC connector can be interfaced with interface modules such as Seven Segment Display, Elevator, Traffic Lights, Dual DAC, Txdr ADC etc… which are developed by GSASMSPL. With its extensive features and capabilities, it is a board that can accelerate your development with ARM-based products. 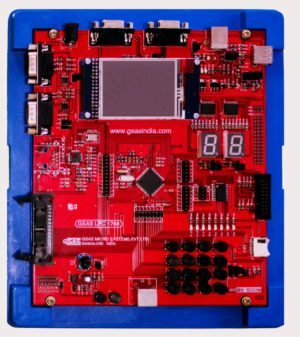 This board also serves as an excellent educational tool for training of next-generation embedded engineers at educational establishments.